It's a good thing this incredible shark encounter was caught on film, or else nobody would believe it. This week, marine biologist Mauricio Hoyos Padilla shared footage of the exact moment he came face-to-face with a massive great white shark while diving near an island off the coast of Mexico. The ginormous predator can be seen casually circling Padilla's protective cage, dwarfing the diver with her robust frame. And what did Padilla do in that moment? He popped out to give the big girl a high five. It's no secret that great white sharks can grow to be quite big, averaging about 15 feet in length. 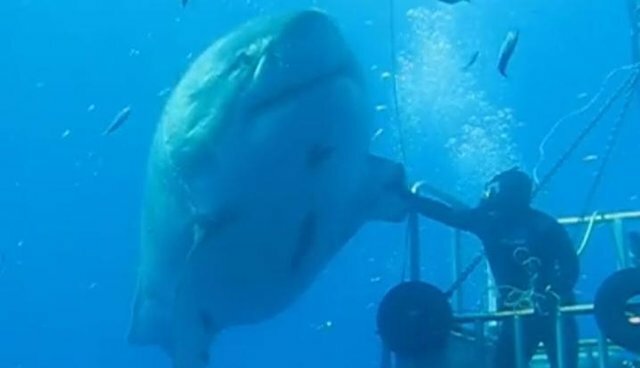 But the shark Padilla met is thought to be more than 20 feet long, which the biologist says makes her "the biggest white shark ever seen." Despite the species' rather menacing reputation, this particular shark seemed to take Padilla's funny little gesture in stride - reaffirming the fact that sharks have far more to fear about humans than the other way around.